Abstract: A successful orthodontic treatment goes hand in hand with patient compliance and clinician skills. 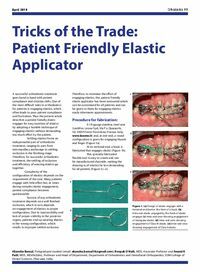 One of the most difficult tasks in orthodontics for patients is engaging elastics, which often leads to poor patient compliance and frustration. Author notes: Akansha Bansal, Postgraduate student (email: akansha.bansal18@gmail.com), Roopak D Naik, MDS, Associate Professor and Anand K Patil, MDS, MOrth(Edin), Professor and Head of Department, Department of Orthodontics and Dentofacial Orthopaedics, SDM College of Dental Sciences, Dharwad, India.